“All warfare is based on deception,” Sun Tzu wrote in The Art of War, an ancient Chinese military treatise, often regarded as one of the most influential books ever written on war strategy. For centuries, Sun Tzu’s words have been gospel for military strategist, businessmen and lawyers alike. Military deception is as old as war itself. The great city of Troy fell to the Greeks largely because of the Trojan horse—a deception. Smoke screens, a deceptive technique used to mask the movement of military units, were first used by the Greeks during the Peloponnesian War in the 5th century BC. During the Gothic War between the Byzantium Empire and the Kingdom of Italy, Roman General Belisarius lit a long chain of campfires to exaggerate his troop’s size, causing the much larger army of Goths to flee in panic. The Mongols often lured their enemies into traps by feigning retreat. They also used straw dummies to give an impression of a larger army. Quaker guns at Manassas Junction March 1862. Deception proved very fruitful during the American Revolution in 1780. 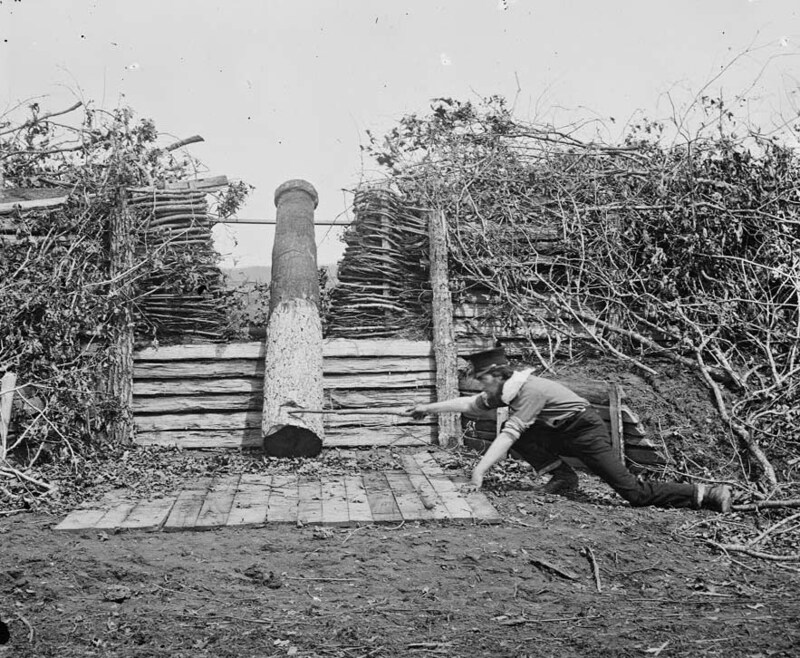 When the continental forces under the command of Colonel William Washington attacked a fortified barn near Camden, South Carolina, where the Loyalists under Colonel Henry Rugeley had barricaded themselves, the Colonel asked his men to surround the barn and prepare a pine log that resembled a cannon. He pointed the “cannon” towards the building and threatened to blow it away if the Loyalists didn’t surrender. Rugeley’s men meekly surrendered without a single shot having been fired. This was the first recorded incident of a “Quaker gun”—the name is a reference to the religious community of Quakers who believed in pacifism and non-violence. One early example of Quaker guns occurred on September 28, 1861, when Confederate forces evacuated Munson's Hill , Virginia, leaving their earthworks to an advancing Union force. 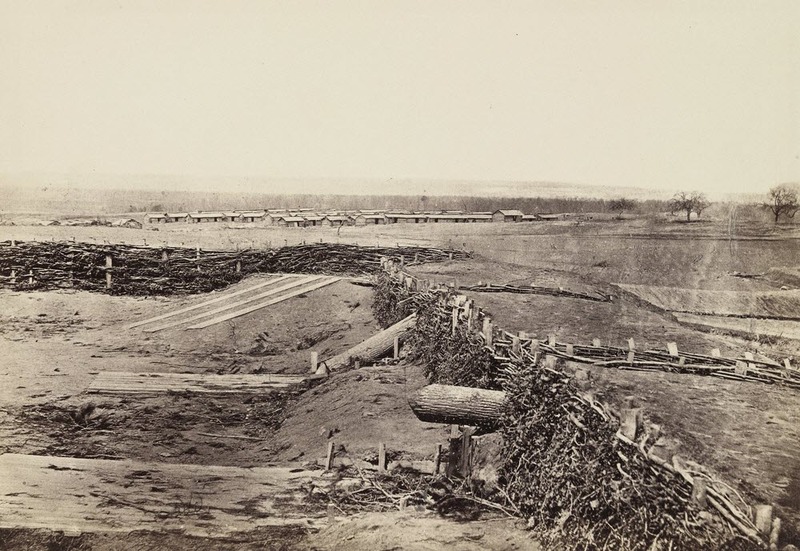 When the Union soldiers reached the Con­federate lines, they discovered two logs and one stovepipe guarding a shallow ditch rather than the three Parrot guns reported by Union scouts. During Major General George B. McClellan 's Peninsula Campaign (March—July 1862), Confederate defenders attempting to delay the Army of the Potomac again resorted to deception. In early 1862 McClellan, never an aggressive commander, refused President Abraham Lincoln's repeated request that he advance south from Washington to Richmond, choosing to believe reports that he faced almost 100,000 Confederate troops at Manassas Junction, supported by more than 300 artillery pieces. In reality, his front was opposed by only 40,000 soldiers and a wide assortment of Quaker guns. McClellan's hesitation combined with the gullibility of Union scouts led to a delay of weeks, which allowed Confederate general Joseph E. Johns ton to organize the defenses of the Confederate capital. When Johnston ordered the evacuation of the Manassas-Centreville line, newspaper reporters quickly noticed that he had left a significant quantity of desperately needed artillery. To McClellan's humiliation, after closer inspection it was determined that the ''artillery" were logs painted black. In the Siege of Yorktown (April 5—May 3, 1862), Confederate major general John B. Magruder also made extensive use of Quaker guns. 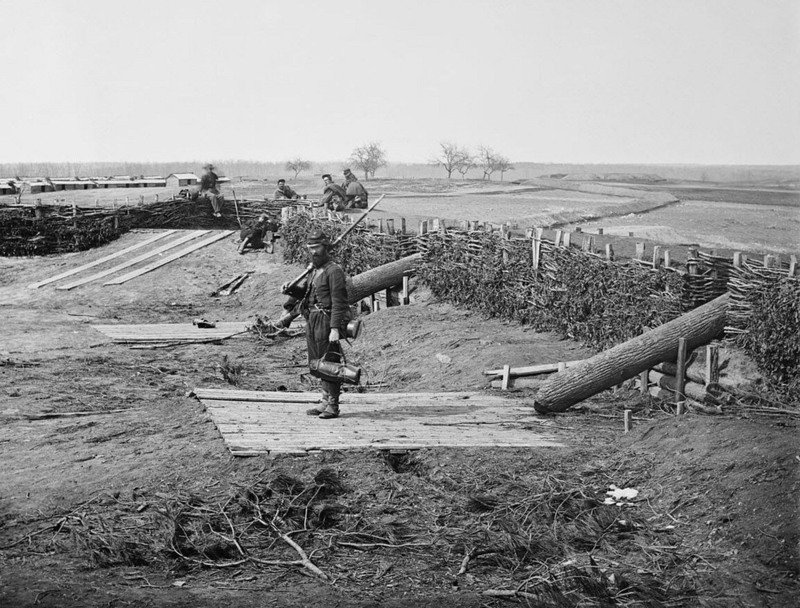 The Union side also employed Quaker guns in the Peninsula Campaign (March-July 1862).